As small as they are, rats and mice can create big problems in your home. 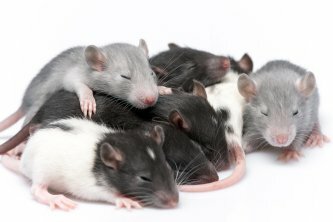 In addition the structural damage caused by a rodent infestation, rats and mice can also spread dangerous and sometimes fatal diseases to your family and pets. If you recognize signs of a rodent infestation in your home, contact a rodent exterminator in Pleasanton as soon as possible. Once the rodents are gone, follow these tips to keep your home rodent-free. You can also use these tips if you have not yet experienced a rodent infestation and wish to keep it that way. Rats and mice can find their way into your home through cracks, crevices, and holes smaller than a dime. When sealing up entry points outside your home, look in the roof among the rafters and eaves, around window, doors, and the foundation, and around holes and piping for electrical, plumbing, cable, and gas lines. Inside, check under and behind kitchen cabinets, inside closets near floor corners, around floor vents and dryer vents, and in the basement or crawlspace. Rodents are only attracted to homes that provide suitable living conditions—namely shelter, water, and food. In addition to making your home less accessible, eliminate food and water sources around the exterior and inside of your home to steer rats and mice elsewhere. To make sure rodents stay out for good, you must identify all possible entry points and food sources around your home. This can be challenging to the untrained eye, which is why you should hire a rodent control professional serving San Francisco and San Jose to inspect your home and develop an effective rodent-proofing strategy. The rodent management professional can also recommend treatment options should mice and rats be discovered in your home.